Masako Onodera utilizes craft techniques in her art and connects the audience emotionally to the materials and practices employed. Her creations suggest an experience of the body altered by the tactile and visual characteristics of the object. Onodera became a faculty member at the University of Wisconsin-Stout in Menomonie, WI in 2012 and currently is an Associate Professor of Metals and Contemporary Art Jewelry. She also teaches 3D design, 2D design and leads the study abroad program in Japan, titled Material Exploration in Object Making at the university. Onodera was awarded a Mid-career Educational Endowment Scholarship from the Society of North American Goldsmiths in 2016 and the Ohio Arts Council Individual Excellence Award in 2011. Her work is published in journals and books, such as Metalsmith Magazine, Art Jewelry Today series from Schiffer Publishing, 500 series from Lark Crafts, and ACTIVA from Design Deffusion Edizioni, Milan, Italy. Onodera’s art is exhibited nationally and internationally such as Uneasy Beauty: Discomfort in Contemporary Adornment, Fuller Craft Museum, Brokton, MA, Plastic, Plastic, Plastic, Kimhyunjoo Gallery, Seoul, South Korea, and Jewelry Exhibition in 2017-18 -The Future Room, the Jewelry Museum of Vicenza, Vicenza, Italy. Her work is part of many private and public collections such as the Museum of Contemporary Craft, Portland, OR, the Mobile Museum of Art, AL, the Toledo Museum of Art, OH, and the Racine Art Museum, WI. She has curated the exhibition Resolutely Ambiguous at the Shop, Walker Art Center in Minneapolis, MN to showcase the contemporary metal art and jewelry in 2014. Born and raised in Yokohama, Japan, Onodera graduated with a BFA in Interior Design from Joshibi University of Art and Design in Tokyo. 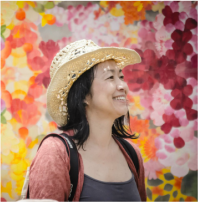 After she worked as a landscape architect in Tokyo, she moved to the US in 1999 and graduated with an MFA in Metals from the University of Illinois at Urbana- Champaign in 2008. Onodera is a member of the Society of North American Goldsmiths, American Craft Council, Michigan Silversmith Guild, and the Minnesota Jewelry Artists Guild.